I, after much internal debate, recently decided to leave Myanmar, clocking in my stay at a year and a half. But I didn’t go before getting one last story on Editor Yoshi’s desk at Newsweek Japan’s office in Tokyo. The team there has been greatly interested in the country’s transitional politics play, given that business links between the nations only continue to grow. 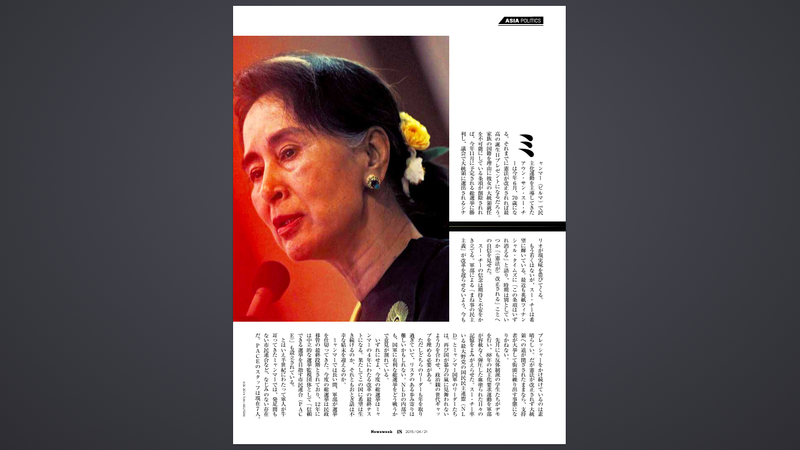 Japanese companies are extensive investors in Myanmar. Sumitomo, a large Japanese conglomerate, for example, joined Myanmar’s national telecom in a partnership to defend against incoming international competition. They did superbly — much better than most expected. Myanmar’s amorphous political nature, the catalyst of the top-down style reform, is, thus, a topic of much focus and, more recently, concern. A general election is scheduled to run in November of this year; it will be the first great test of the reformist government’s transition towards some semblance of a democracy. But after interviewing the man directing the monitoring of the poll, a director at a major US NGO and talking Burmese-style politics with many a Myanmar person (yes, there still is no pleasant demonic), a free election — perhaps merely to match the government’s emphasis on creating a free market — is all that we can all expect. It will take place under the direction of a still comfily entrenched military, who are, by nature and reflex alone, more capable of making a mutated “Burmese Way to Democracy” rather than any representative system acceptable to the West or the NLD, the opposition party. 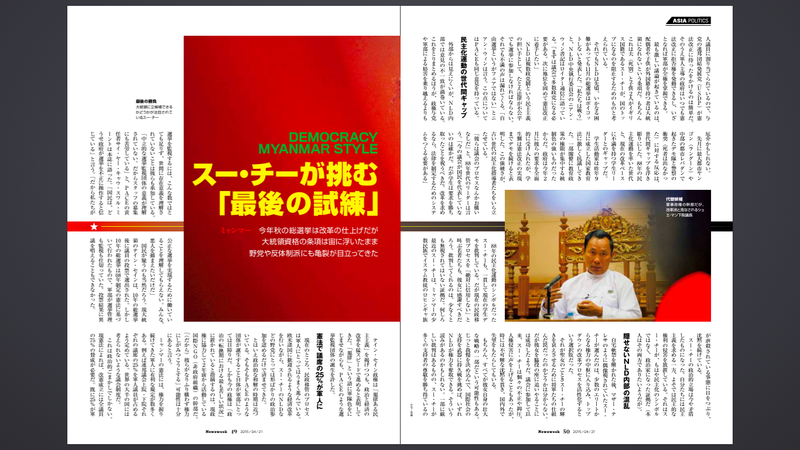 Originally published on April 21, 2015, in Japanese, my article on the upcoming election is reproduced below in English. Enjoy. This June, democracy icon Aung San Suu Kyi will celebrate her 70th birthday. There can be no greater birthday gift, one must imagine, than for her to witness the removal of an unfair provision in Myanmar’s constitution that bars her from fulfilling a saintly prophesy of running for president in this November’s general election. Yet, despite her age, youthful optimism shines through. Suu Kyi recently told the Financial Times that “this kind of clause cannot exist forever,” hinting that she is still confident that “[the constitution] will change,” though a timeline is uncertain. Her conviction can be seen as good or bad. Good that Suu Kyi is willing to tirelessly pressure the military-installed “parody of democracy” from stagnating in its reform process. Bad that it could provoke Suu Kyi’s legions of adorers to take to the streets in her defense if an unchanged constitution blocks her candidacy. Ever the bastion of political dissent in Myanmar, student activists already appeared in street protests last March, evoking an eerie shadow of the violent 1988 uprising in the conflict-torn country. Myanmar’s aging leaders – both from Suu Kyi’s National League for Democracy’s (NLD) and the Tatmadaw, Myanmar’s ethnic Burmese military – must work together to assuage a potentially destabilizing generational gap in political views if they don’t want the system to once again boil over into violence. It could be that senior members of both parties are already too old to push for risky concessions. But there is a climate of confusion in the ranks of the NLD over how to exactly compete in the elections, pressure that the Tatmadaw are likely content to have placed there. Unquestionably, this is a final test for Myanmar’s much-observed four-year reform era, one that will presage the continuity of hope, or ruin the fairytale story with a dark ending. Managing an election is nothing new in Myanmar, but a non-military organized poll is a concept that was long absent from the collective political lexicon. The People’s Alliance for Credible Elections (PACE) itself is a young organization, set up in 2012 after the reformist government began its current transition with the ultimate goal of holding a general election, scheduled for November this year. But in Myanmar, a country ruled by a tight coterie of military generals for five decades, the group of young non-governmental workers seems that much more novel. Monitoring the election, PACE concedes, requires more people than the seven present, and is an alien project to the majority of the public. This suspicion is reasonable. In 2010, the bi-election that ushered in President Thein Sein was anything but non-partisan, being wholly monitored and organized by the military, keeping in tow with how such political events were exercised in the past. There was no avenue to contest the results. But the majority military-run government’s apparent epiphany to detract away from its model of “disciplined democracy” in exchange for a full-throttle raft of political and economic reforms has since instigated the existence of a electoral monitoring group, one such as PACE. So far, the general’s approach to transition has materialized favorably for them; its helped to legitimize hitherto gains through Western-condoned economic reforms, while extending only marginal political participation to opposition groups, namely the National League of Democracy, the party of democracy icon Aung San Suu Kyi. But the time for political reconciliation is at the doorstep. PACE’s initial formation in 2011 was a specter to this very day, and the government is finding itself in “the worst part of the political transition, one where we shouldn’t be surprised if they don’t want to give up power,” a director at an international NGO working with the Myanmar government for two years told Newsweek. That hope for compromise, thus, could instead turn out to be only a fool’s optimism. As it lies, there are many clauses in the Myanmar constitution that are crafted to play into the hands of an entrenched elite – men wearing olive-green jackets cloaked in the proverbial smoke-filled room. By no accident, the constitution requires that 25 percent of parliament be exclusively appointed from the Tatmadaw, a provision that makes Myanmar’s parliamentary system a global anomaly. This legal legerdemain is intended; given that the constitution calls for 75 percent of parliament to agree to pass any legislation, the ruling Union Solidarity and Development Party (USDP) only needs a mere 1 percent of the house to be voted in to block any bill from amending the constitution. Moreover, the military government can veto any constitutional change and has the right the seize power at any time. The most vociferously debated part of the junta-drafted constitution is Article 59(f), which prohibits a president from having a spouse or children from a foreign nation. This, of course, is widely understood to prevent Aung San Suu Kyi, who married a British citizen, from running for the nation’s top office. Myanmar observers know that the NLD has to enter the elections, no matter the predicated rules, to stand upon its laurels of multiparty compromise. But that doesn’t bar the party from due grumbling. “The election may be free, but it won’t be fair,” Nyan Win said, a point that even PACE agrees with. It may not be inevitably observable, but the NLD has an internal crucible yet to be overcome as well, one beyond the external barriers strategized by the USDP. 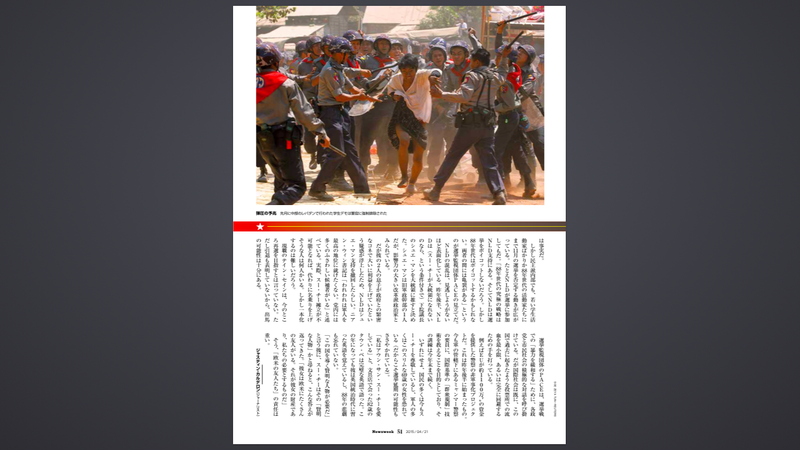 Recent scuffles between protestors and police in Yangon and Letpadan have exposed a generational gap between the original 1988 movement leaders and those students of today in a difference of opinion about the pace of reform. (Thankfully, there were no deaths.) Student activists have attacked an education law that will allow a small group of ministers oversight into the nation’s educational policy, plans and curriculum, evoking concern over the creation of a nanny state. But when the government accepted their demands, the students continued to protest, making accusations that reforms have stalled and causing frustration among the elder generation of democracy leaders. Suu Kyi, herself an icon born of the 1988 movement to unseat the military, has openly criticized the tactics of the protestors, some of which were not students. This disillusioned faction, who “never believed” in the credibility of the current transition, should feel lucky to have received such a candid response from “The Lady”, as she is fondly known in Myanmar. Over the past year, Suu Kyi has been criticized by international human rights groups for remaining quiet over the plight of Muslim Rohingyas, a minority group that has become the target of state-sanctioned pogroms. Her choice of political stance now comes across as oddly arbitrary, at odds with democratic principles in some places, but vocal in others. Suu Kyi is “conflicted if not confused,” an international observer providing support for democratic reform told Newsweek. When she came out of house arrest, the Mother Teresa-like icon conscribed to working within a small group of powered elite, the country’s nexus of power and the option for galvanizing true transformation in a top-down reform process. Whether or not the general’s specifically planned to pigeon hole the democracy leader to ebb away at her sainthood is a matter of conjecture – but it seems to have worked. Since joining parliament, she has at times been vocal in the face of injustice, oppression and incursions of human rights, and at other times disturbingly mute, leading to a tinged reputation abroad and disappointment at home. This maybe part of Suu Kyi’s own grand strategy, too, one in which the NLD ultimately dissolves power away from the generals through a war of quiet attrition and Western-backed browbeating. And, despite her harsh judgments, Suu Kyi’s supporters still revere her. But younger protesters, and even the 88 Generation leaders will not so readily be willing to recognize the upcoming elections, even if the NLD is willing to compete. “Their [the 88 Generation] ultimate strategy is to support the NLD. The NLD will not boycott the election, but the 88 Generation may. There is a disconnection amongst these political forces now,” Sai told Newsweek. The NLD’s confusion manifests itself in areas too paramount to overlook. Late last year, the party gave a nod to Shwe Mann, the speaker of Myanmar’s lower house parliament, saying that he could be a candidate to represent them if Suu Kyi still was prevented from running. Shwe Mann is considered a reformist-minded politician with great influence, coming from a history as one of the leaders of the former junta. But both his sons face allegations of cronyism, having greatly profited from close government connections; these interests have sullied Shwe Mann’s reputation in the eyes of the NLD. Nyan Win recently flip-flopped on backing Shwe Mann, saying, “We don’t want to see an army man in the top post. We have many people in the party qualified.” Now the NLD has few other candidates to put forth in the election besides the constitutionally invalid Suu Kyi, leaving observers with bated breath over what conflicts could arise. President Thein Sein has yet to announce a bid for a second term, but, while he has gone on record saying that he will not rerun, true to Burmese-style politics, the subtext of such rhetoric can be read in reverse – he hasn’t completely ruled out a campaign yet. Meanwhile, Sai’s team at PACE is only just sizing up the immense duty laid out before them. Before this November, up to 2,000 volunteers will be recruited to monitor about 1 to 2 percent of the country’s polling stations, paying a methodologically deduced amount of attention on those locations where political contest is most likely to occur. In the 2010 election, violent incidents arose around these stations, and, given the gathering storm of anxious and concerned protestors, many expect it could happen again. Sai says that in order to “mitigate violence” political parties and civic society need to discuss potential conflicts before the election. But beyond a general boost in public-party communication, international players have already interjected their own programs to ensure that the kind of ballot bloodshed Myanmar has a history for is minimized or altogether avoided. It starts will the demilitarization of police. A European Union-funded project began in late 2014 to introduce internationally acceptable standards for “crowd management” to Myanmar’s police force, which is still operated by the military. The $13.6 million project is due to run 18 months, through the date of the election. Results have already presented themselves: the fact that police broke up recent protests using batons and not automatic machines guns gives just credence to the improvement in community policing. Whether or not The Lady condones the protestors or the opinions of the 88 Generation, many in Myanmar still revere her. Speculation that the election could be postposed strictly originates from the central government, where many men in uniform still fear the fragile 69-year-old woman after so many years.